The old Ozkan's Grill in Market Street, Galashiels. North Tyneside-based bakery chain Greggs is hoping to open a continental-style pavement cafe on a popular site at the heart of Galashiels. The company, the largest bakery chain in the UK, has submitted a planning application to Scottish Borders Council for a new outdoor cafe in Market Street at the unit formerly occupied by the Ozkan’s Grill kebab shop. Its application was withdrawn just days after it was submitted this week, but it has now emerged that that move was merely a technicality and the bid is to be resubmitted before the end of the week. A Greggs spokesperson said: “We realised after we submitted the application for the pavement cafe that we also needed to apply for change of use for the indoor premises itself. If the proposal is agreed, it will be the second Greggs outlet in the town, the other being in Channel Street. The application seeks approval for a new aluminium shopfront, condenser units and use of the outside of the premises for a pavement cafe offering four tables and 11 chairs for customers. Greggs, launched in Newcastle in 1951, now runs more than 1,600 shops nationwide. 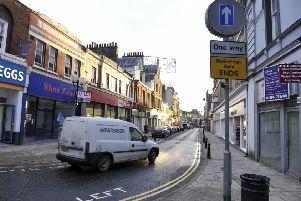 It already has five outlets in the Borders, the others being in Selkirk High Street, Hawick High Street, Kelso Square and Peebles High Street, in addition to two shops in nearby Berwick in Northumberland.